A large figurative portrait of a frail, distraught-looking lady set against the backdrop of Pattachitra paintings from Raghurajpur in Odisha adorns the wall at artist Vinita Dasgupta’s first solo show titled Storytellers. Although all her works on display were sold out, this is one piece that Dasgupta says she will never sell. “This is a portrait of my dida (grandmother) and she is my storyteller,” says the 30-year-old artist. The series of paintings depicts a new pictorial style and artistic practice that she developed three years ago after visiting Raghurajpur. Although the village is known for its heritage of Pattachitra paintings that date back to 5 BC, to the artist, it is a cradle of early childhood memories and stories that her grandmother used to tell her. Much like the Pattachitra paintings that depict tales from Hindu mythology in a pictorial form, her grandmother too would narrate mythological stories and folk tales. As Dasgupta grew up and graduated from Delhi College of Arts, the memories of Raghurajpur faded, but not the influence of her grandmother, who continues to be an inspiration for her work. “The biggest strength of a woman is her power to love,” says the artist. “And it starts with the ability to love oneself.” That’s one of the lessons that her mother and her grandmother taught her. No wonder Dasgupta’s early works have a deeply autobiographical touch. She used self-portraits to create metaphors of herself and her realisation of womanhood. These early works are characterised by broad, free-flowing brush strokes. “Here was a woman who painted like a man and that is what drew me to her work,” says curator Rahul Bhattacharya. “But that style comes naturally to her.” And she never changes her style until she gets bored of it. Although a personal connect with Raghurajpur drew her to the village at first, the craftsmanship, detailing and precision of the folk painters inspired her to incorporate elements of their work into hers. “It was these artists who helped me realise that something ‘popular’ could also be deeply rooted in discipline and have a strong cultural dialogue,” she says. Since then, Dasgupta has adopted a more controlled technique and introduced new compositional elements in her work. Although initially she transposed motifs from the village onto the borders of paintings depicting popular personalities, they are now deeply entrenched in her artwork. For her latest series, the artist has painted Pattachitrakathas on small pieces of canvas, rolled them to create small scrolls and used them to create an intricate detailing in her latest series of portraits. “I have seen Vinita sitting in the corner making canvas rolls for hours together,” says Bhattacharya, who feels that Dasgupta’s drive to create art combined with her fidgetiness converts her art into a meditative practice. “What makes her work unique is that it is contemporary, yet embodies our heritage in the form of scrolls,” says artist Niladri Paul. Although Dasgupta has never had trouble selling her work, the detailing in her work is time-consuming; a single piece of work can take her up to three months to complete. 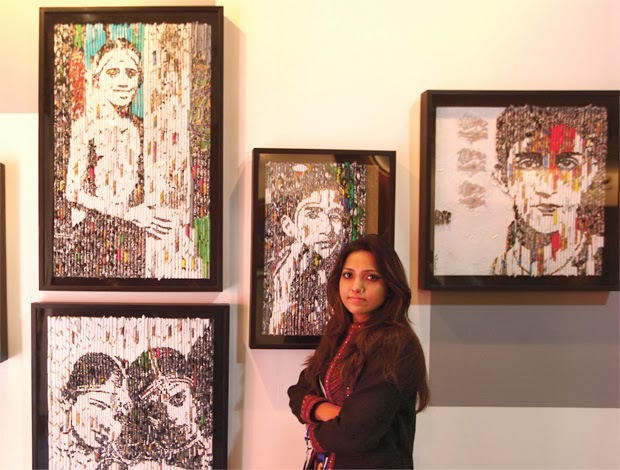 Her works can be bought for Rs 1-5 lakh. Though there are times when she has to struggle to make ends meet, that is about to change with her first solo show being a runaway hit. Perhaps she can now put her energies into refining her work.